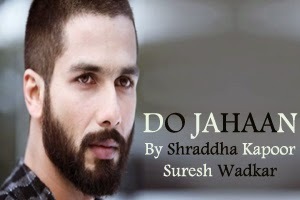 Lyrics Of Do Jahaan From Haider (2014): A Playful song sung by Shraddha Kapoor and Suresh Wadkar featuring Shahid Kapoor, Shraddha Kapoor, Tabu and Kay Kay Menon. Star Cast: Shahid Kapoor, Shraddha Kapoor, Tabu, Kay Kay Menon. The jukebox audio video of this song is available on youtube at the official channel Times Music. This video is of 40 minutes 38 seconds duration. The live recording Shraddha Kapoor goes Kashmiri video of this song is available on youtube at the official channel Times Music. This video is of 1 minutes 52 seconds duration. Lyrics in Hindi (Unicode) of "दो जहाँ"